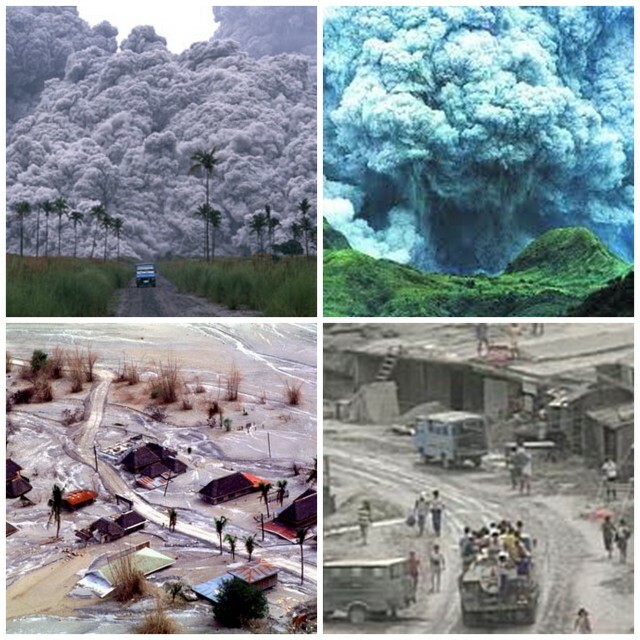 Exactly 22 years ago today, (June 15, 1991)– Mount Pinatubo in the northern part of the Philippines erupted. Before that, the volcano was almost unknown because it was heavily eroded and covered with dense forest (therefore almost unseen). In these forests lived several thousands of Aetas (indigenous people), who fled north towards the mountains during the Spanish conquest. I was 10 years old and studying in Manila when the eruption happened. I remember as a kid finding it strangely cool that for almost an entire week, it was darkness. And everyone in school had to wear masks. In Manila at least, that was the extent of the volcanic disruption. Olongapo City, 126 Kms north of Manila, is where our family business is based. This is where our first family home is, and where most immediate family and relatives are. 133Kms away from Mount Pinatubo, the city wasn’t as lucky as Manila. The first immediate damage coming from the eruption was Lahar, or mudflow. Several towns were wiped out immediately. I still remember passing by roads and seeing house roofs and church steeples sticking out from the ground. These were the more severe damage as lives were lost. The next wave of damage was the massive ashfall. Imagine heavy snow falling. Except it isn’t snow. It’s volcanic ash. This went on for days. And although my family evacuated from Olongapo to San Juan (where we lived in Manila) for safety, the Olongapo house and our family business store ( a bicycle and motorcycle shop) was left to weather the ashfall. Ash gathered on rooftops of houses for days. As the ash piled up heavily, it caused pressure on the roof tops. The house at least, wasn’t so damaged. When people inside the house (my aunts, who were still there on the 11th hour) noticed that they couldn’t open the kitchen cupboards anymore (due to the mounting pressure) they all rushed to the roof and tried to shovel out ash, sand and mud from the roof. Back in Manila, I remember that fateful call my dad took. It was the first time in my life (as a 10 year old) that I’d seen my dad so crestfallen. Our bicycle shop, which he had started from scratch, collapsed. I don’t need to imagine his heartbreak. He started the business all on his own from bare necessities. Yes, my dad was a remarkable rags to riches man and I’m ever so proud of him. This post comes at an opportune time for it’s Father’s Day tomorrow. In my heart, every single day is father’s day because there isn’t a day that goes by when I miss him terribly so. Needless to say, my family picked ourselves back up again over the next months and years to come. 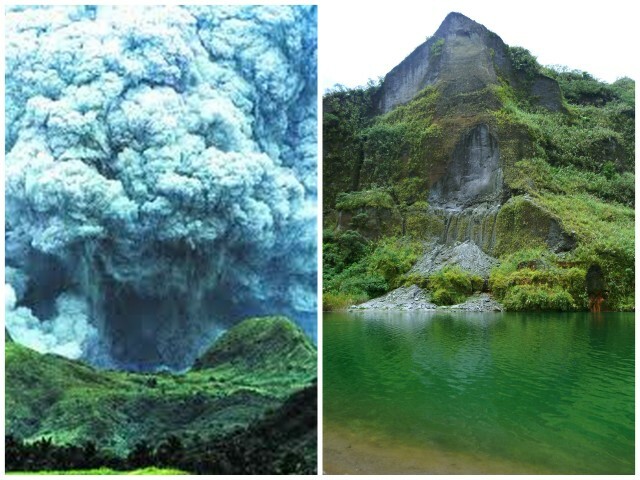 But the chilling thought of Pinatubo and the horrendous effects it had in Zambales (northern part of the Philippines) never left my family. 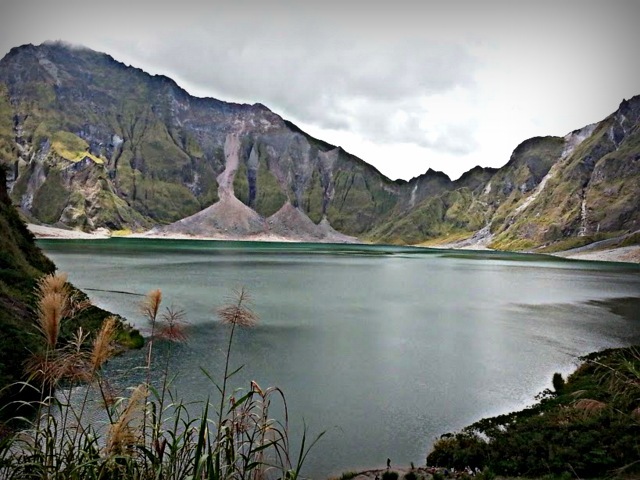 22 years on, Mount Pinatubo has remained dormant. On my trip last month, I decided to conquer this damned volcano that shook thousands of famillies’ lives, mine included. Potholes and road damages are unsightly. 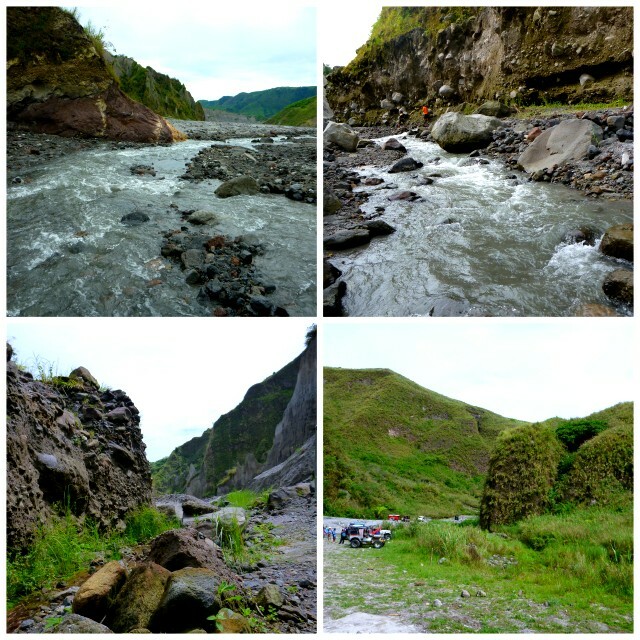 But the rough road to Mount Pinatubo is a pretty face. It’s very picturesque, and some landscapes remind me very much of Lord of the Rings’ Mordor. The first part of the trek is a 4 X 4 drive to the base of the hike. And I have to say that I liked the hike more than the jeep ride. While the views were incredible, we were being rocked and rolled inside the Jeep like a lottery ball draw. When we finally reached the base to start the actual hike, I was so relieved to be stretching my joints and muscles that the climb didn’t feel too exhausting. Same with life, the more rough roads you encounter (inevitably or by choice), the more unfazed you are when dealing with issues and situations. We love a good Jeep! 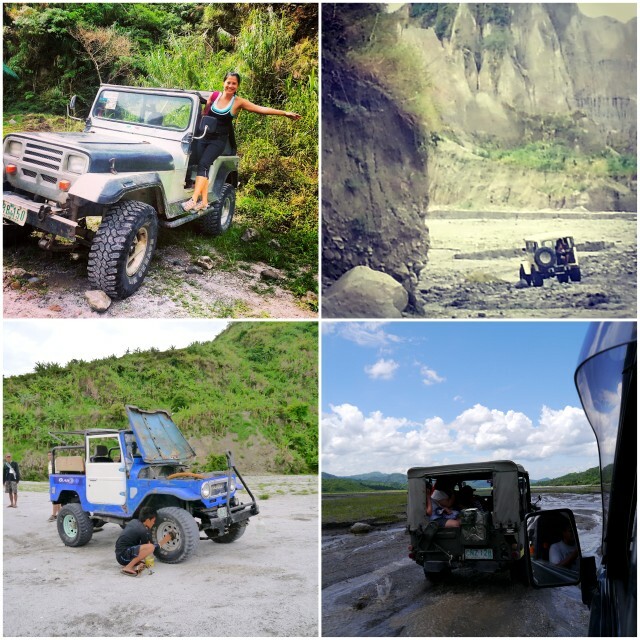 Anywhere in the world, Jeeps are guaranteed to give you a good time. Low-maintenance, rough-road ready and good looking too! Our car here in Sydney is also a Jeep and parking is such a breeze. My favourite Jeep experience by far? Driving it in the thick of the Mexican jungle! When you’re out of breath and sweaty in all crevices of your body, this sign post is like an angel sent from above. I thought that was a halo right above the sign! This short trek is just a small example of how every “climb” in life will always be rewarding if you persevere and not give up. We all have our short or long-term goals. Be it losing weight or getting the job of your dreams. Whenever you think of quitting or giving up, just be reminded of how you would love to give yourself a kick in the face had you known you were just inches away from your goal when you gave up. i don’t bond over coffee. i bond over experience! I think I have a notorious reputation among my family for forcing dragging them to heart-pumping activities. A couple of years ago I was so into running marathons, I had my mom, sister, aunts and cousins also running with me. 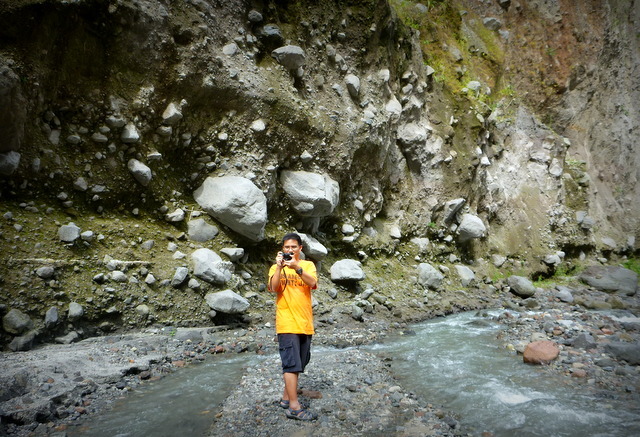 Now on this Pinatubo climb, it was my idea that we all do it together. I’m not really into the ‘let’s-have-coffee/drinks’ type of bonding. I don’t even drink! So I’m grateful that my family and friends still did the hike with me even though I know it’s not really their cup of tea. It’s not that I’m not considering what they want or don’t want. I just want us all to have healthier lifestyles and see new places together. Ka-Ching! You hit 2 birds in one stone. my mom, at 67 years of age has reached the top of a volcano. 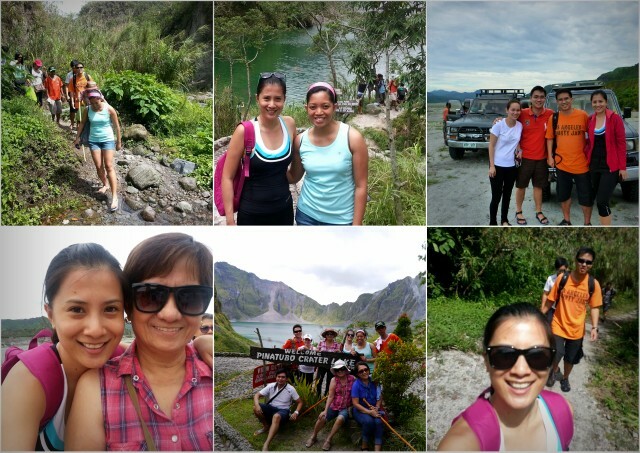 If you are thinking of taking your parents to Mt Pinatubo, I highly urge you to do so! But of course, take into consideration their health. 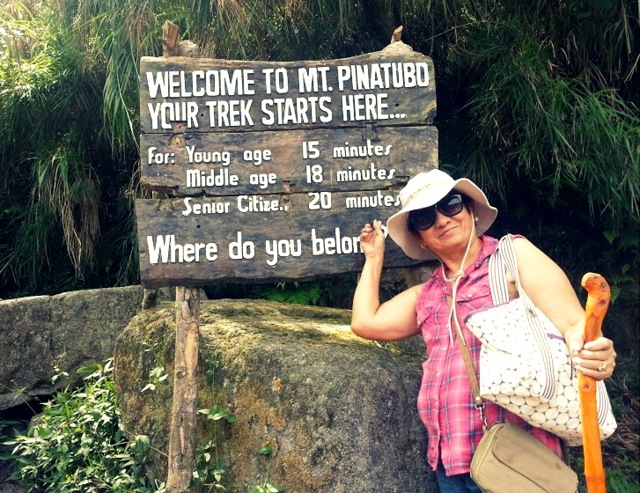 My mom is diabetic (hence my push to do tons and tons of outdoor activities!) 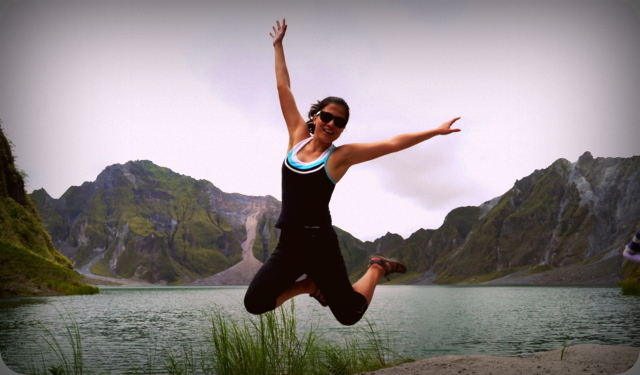 but physically still well and able to reach the top of Mt Pinatubo. The staff gave her a walking stick, that looked like it was borrowed from Gandalf, but it was a huge help. On a day to day basis, I try to limit (if I can help it, not at all) my rice intake. But when you are in Asia, and the Philippines for that matter, you almost have no choice. Rice is King in the Philippines. The only time white rice is good for you , is when you are doing almost non-stop activity for the day, which means you will easily burn it off. 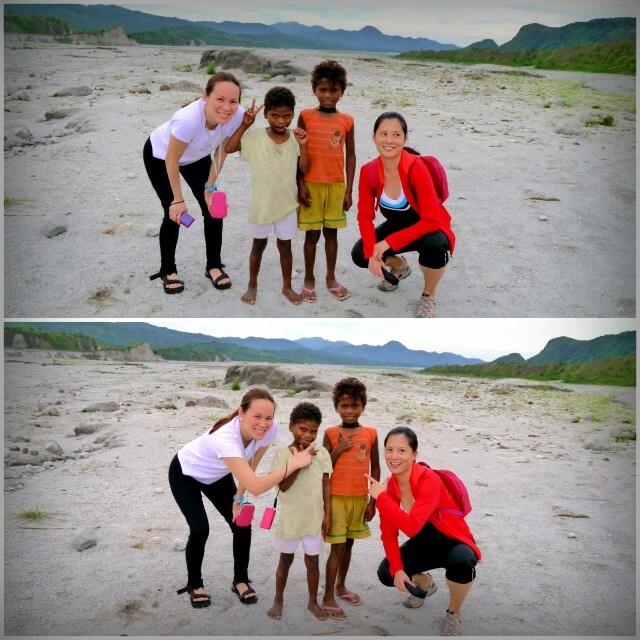 Such as this day we trekked Mount Pinatubo. Part of the deal we got included breakfast at the meeting point early in the morning (right). We had breakfast of rice and grilled eggplant. 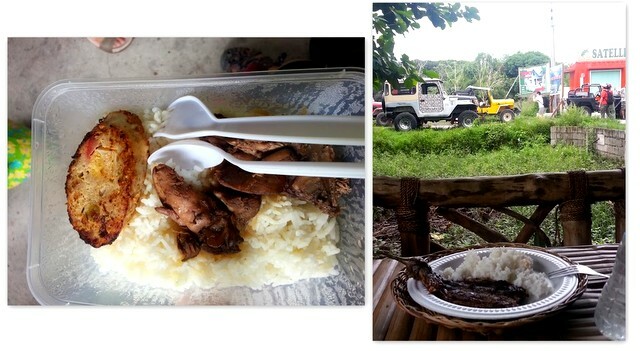 We packed our own lunch that my aunt made for us (left) of Morcon (meat loaf) and adobo. It was rice-heavy but excuse-able for the day. I kept knocking my head on the window at least 5 times (on the same spot! ), but always insisted on sleeping. When I woke up, it was the worst feeling ever! Stiff neck, shoulder pains, and a sore spot on my head. 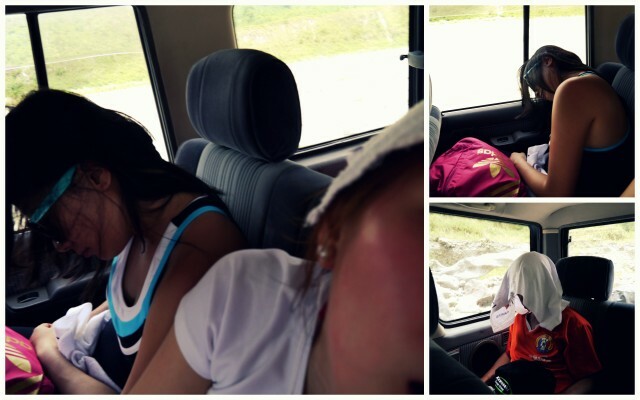 And someone is always guaranteed to take a picture of you while sleeping. It’s quite unbelievable that the monstrous eruption came from a place that could be this beautiful. It’s a figurative example of how we, as persons, need to “erupt” or let go from time to time. Let go of all negativity. Time is too short to dwell and worry on things you cannot change. The only thing you can change is yourself. If something or someone is making your life more doom and gloom than helping you become more positive, then change your situation- leave them! Don’t brood and hide your feelings for so long until it starts to fester. 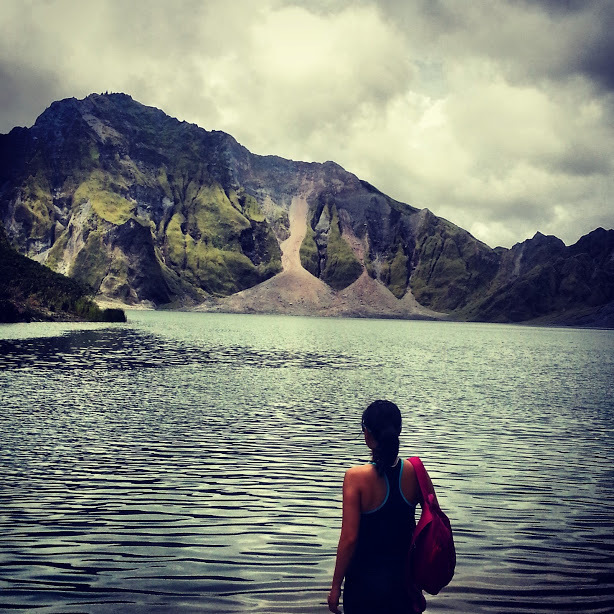 Look at Mount Pinatubo. All that rage inside her was probably too much to bear that she’s finally “had it” in 1991 and BOOM! devastating eruption. Same goes with positive things. Have you always wanted to learn how to dance? Been yearning for someone to teach you how to dougie? Itching to cross off that bucket list? Travel? Stop making excuses and do it now! at the end of the day, let there be no excuses, no regrets. WHAT ARE SOME OF THE BEST LESSONS YOU HAVE LEARNED IN ONE DAY?? Finding Gold in Iceland’s Golden Circle Glacier Hike and Ice Climbing in Iceland Iceland Activity: Snowmobile Adventure on a Glacier The Quirky Streets of Penang The Grand Canyon Made Me Go “Holy S…..!” Scuba Diving, Snorkelling, and Food Tripping. Things that the Philippines and Malaysia are made of. I’ve been reading your blog for so many years already and this is my first time to actually comment. 🙂 I love how you see life and how you regard your family. Very well said. And yes, I’m truly inspired by your travels! OMG!! Wow!! 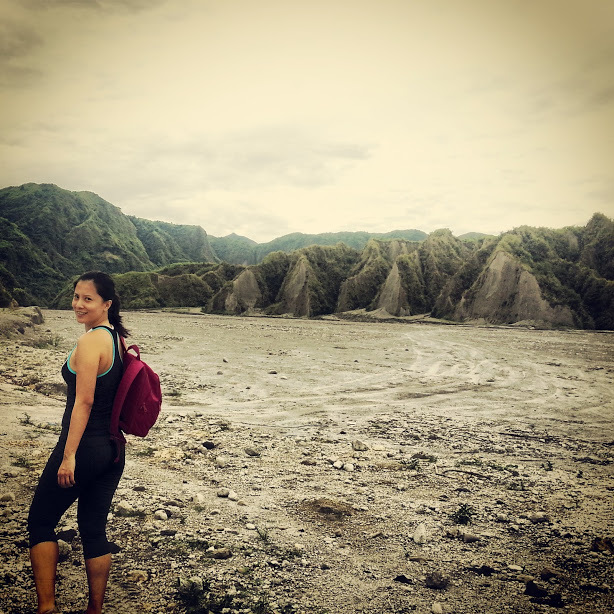 You climbed Mount Pinatubo. That is what I call Awesome adventure on the highest level.. I remember that eruption in the early 1990’s. You have lived lady Smithereens… Laura and I are so moved by your life’s travel experiences. I’ve climbed all the Mountain peaks in the UK, and Climbed Gros Piton and Mount Gimie in ST Lucia Caribbean. At 3,145 feet, this is the tallest of the island’s pinnacles. The nearest I’ve come to a Volcano is the Sulphur Springs Volcano in Soufriere ST Lucia. 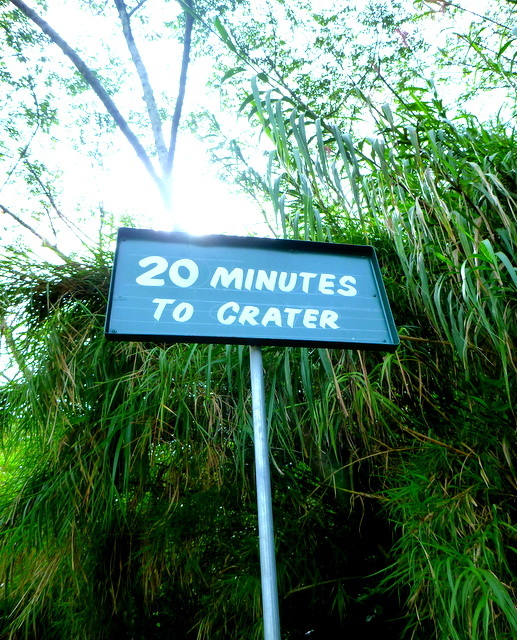 I walked on a solid part of the volcano only to find that it had turned to liquid 1 min later which gave me a real scare. They have sealed it of now restricting tourists from walking over it’s dangerous path… The sulphur has a strong potent rotten egg smell. I did enjoy the sulphur springs bath. It was so revitalising and healing for my skin. If you ever visit ST Lucia you must visit the sulphur springs volcano in Soufriere and check out Jade Mountain resort and it’s Galaxy suit room. I have stayed at Anse Chasnet hotel and loved it… But for my next visit there I want to stay in the Galaxy suit room at Jade Mountain resort ST Lucia…. Thanks again for sharing you wonderful life’s experiences.